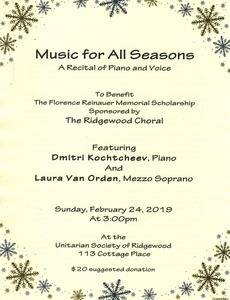 The “Music for All Seasons” recital to benefit the Florence Reinauer Memorial Music and the Marjorie Vandervoort Vocal Awards held on Sunday, 24 February 2019, at 3PM at the Unitarian Society of Ridgewood was an enormous success. 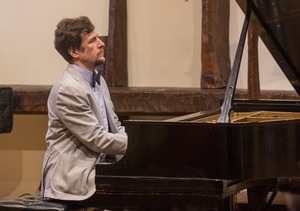 Thank you to our wonderful performers Mr. Dmitri Kochtcheev, Piano, and to Ms. Laura Van Orden, Mezzo Soprano. Thank you to all those who attended and to those who made contributions to our Memorial Fund. 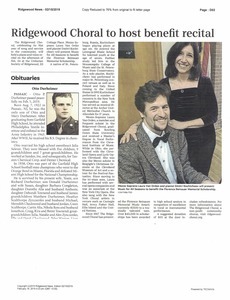 And thank you to The Ridgewood News for its continuing coverage of the local arts. 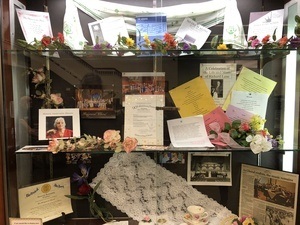 On Tuesday, October 30, 2018, the Choral took a docent led tour of the Van Bunschooten Museum located in Wantage, NJ. The house and outbuildings were listed on the National Register of Historic Sites and Places in 1974, and the house is now used as the chapter headquarters of the Chinkchewunska Chapter of the DAR. The Choral enjoyed touring the rooms of the house, which are filled with an impressive collection of period antiques, many of which were donated by the original family, and used in the home. 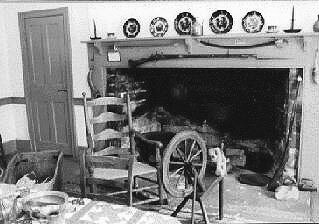 Items in the collection span a range from 1787 to 1860. Following the tour, the Choral lunched at the Crystal Springs Resort Crystal Tavern. 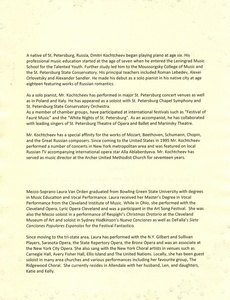 Trips and Tours – Over the years, members and friends have visited, among many sites, Carnegie Hall; the Cathedral of St. John the Divine and the Cloisters; the Music Instruments Collection at the Metropolitan Museum of Art; Westminster Choir College; the Morris Museum’s Guiness Collection of large musical machines and living dolls; Caramoor; Lincoln Center; the Chrysanthemum Festival at the Bronx Botanical Gardens; Liberty Hall Museum at Kean University; Storm King Arts Center and Sculpture Park; Paterson’s Great Falls National Park; New Jersey’s Skylands Manor and Ringwood Manor and Gardens; Montclair Art Museum and the Presby Iris Gardens. 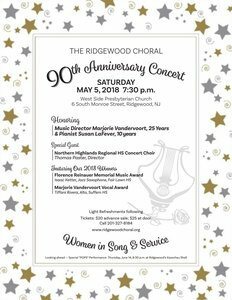 The Ridgewood Choral’s 90th Anniversary Season Spring Concert on Saturday May 5, 2018 was a very memorable and special evening. 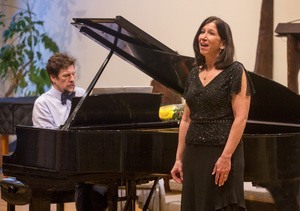 We could not do our concert without the help of stage and lighting crew, ticket takers, ushers, Afterglow helpers, the staff of the Unitarian Society of Ridgewood and West Side Presbyterian Church, as well as many other unsung (non-singing) assistants. From everyone in the Ridgewood Choral, we say a special “Thank You” to all of you for your time, patience and support. 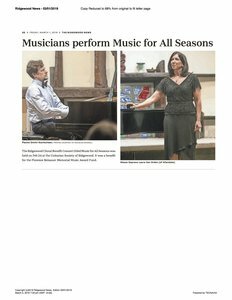 Please note: The Ridgewood News published a full front page about our 90th Anniversary Concert in the Friday, May 18, 2018 Arts Section, including multiple color photographs, which we encourage you to read if you have online access to northjersey.com. 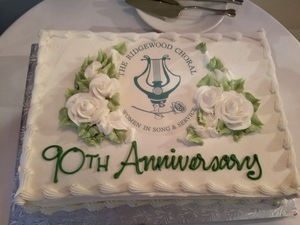 The Ridgewood Choral, under the direction of Marjorie Vandervoort, took the stage once again at the Kasschau Memorial Band Shell on Thursday, June 14, at 8:30 p.m. Four celebrations were marked that evening: The Choral’s 90 years of Song and Service; Vandervoort’s 25 years as Music Director; Susan La Fever’s 10 years as pianist, and 60 years of Kasschau Shell performances “under the stars.” The Choral was instrumental in raising funds to build the shell and performed at the opening night concert 60 years ago on June 17, 1958. The chorus drew upon its extensive library of music to sing American folk songs, show tunes and songs to celebrate Flag Day. Several pieces featured vocal or instrumental solos, duos and trios, including jazz alto saxophonist Isaac Ketter of Fair Lawn HS, the 2018 winner of the Florence Reinauer Memorial Music Award. Many thanks to Boiling Springs Savings Bank for their sponsorship. On June 8th, we gathered with friends, had a delicious lunch AND, most importantly, installed our newly elected officers of The Ridgewood Choral. Many thanks to Justin’s Ristorante, 234 Lafayette Ave, Hawthorne for creating such a lovely event, and to our two performers dear to our hearts – Susan LaFever our accomplished accompanist and horn player and Ron Levy internationally acclaimed pianist/ keyboardist who has appeared in major venues, both as a soloist and in partnership with many of the world’s leading singers and instrumentalists. 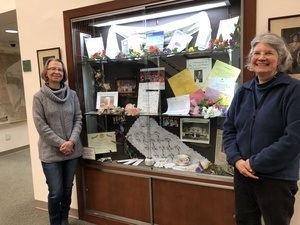 Many thanks to Frieda Holober, Heddi Hoffman, and Mary Boggia, Curators and Historians, who created a display of the Ridgewood Choral Celebrating 90 Years of Women in Service and Song at the Ridgewood Library,125 North Maple Avenue, Ridgewood, NJ 07450. 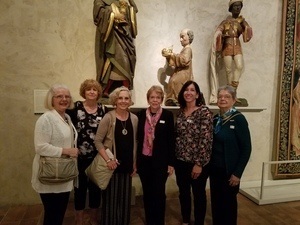 On May 22 the Choral reprised a trip to The Cloister Museum of the Metropolitan Museum of Art. 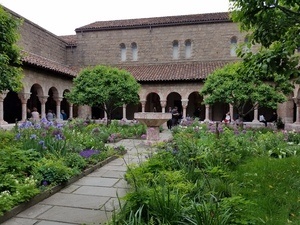 The ‘Cloisters’, located at Fort Tryon Park overlooking the Hudson River, features art, architecture, and gardens of medieval Europe. We took an informative guided group tour. 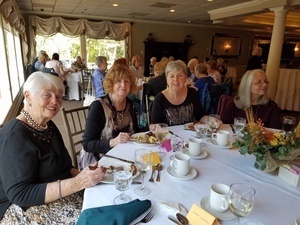 The Gala Luncheon, held on October 22, 2017 at Bacari Grille, Washington Township, NJ, was a wonderful afternoon of friendship and celebration of 90 years of the Choral’s long history of Women in Song and Service. Heddi Hoffman headed the committee. The venue provided a bright, spacious and congenial atmosphere and a delicious menu. The slide show, created by Kelly Van Orden and her mother, Laura, was a treat. 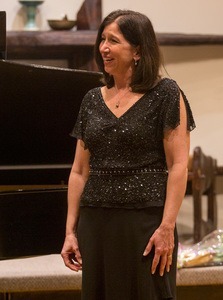 President Thia Longhi served as emcee. Highlight of the day was acknowledgement of Marjorie Vandervoort’s 25 years as our Music Director with the announcement of a $1,200 Vocalist Music Award in her honor, announced by Deb Goodell, Chair of the Music Awards Committee. 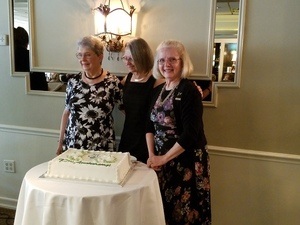 The three longest tenured members, Lorraine Heffernan (42 yrs), Heddi Hoffman, (32 yrs), Mary Boggia (34 yrs) and were given the honor of cutting the special 90th anniversary cake.